Postings this week will include selections from Art and Artists: Poems, an anthology of ekphrastic poems by Emily Fragos, Knopf, 2012. 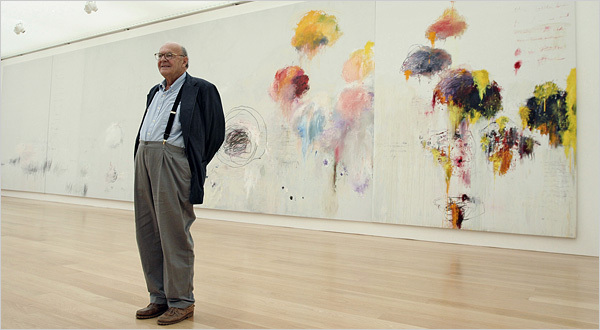 Of his work, the painter Cy Twombly (1928-2011) said : “It does not illustrate. It is the sensation of its own realization.” He was much influenced by poets like Catullus, Rumi, Pound and Rilke. More on Twombly. of Rome in search of him. The artist stands before his monumental painting.